The last time I read an ‘analog’ book, was… ummmm… Wow, I can’t even remember. I’ve been reading e-books on my PDAs and now smartphones for years now. I think the first device that I recall reading on was the Palm V. I love being able to carry a bookcase of books in my pocket. I didn’t purchase Amazon’s original Kindle, because I didn’t think it would be a device that I would carry around with me all the time like my smartphone. Then recently when Oprah featured the reader on her show and offered a $50 discount, Jeanne decided to buy one. I was very surprised because she has always turned her nose up to digital books in the past when I offered to put eReader on her Palm Zire 31. I almost bought one of my own after playing with hers, but I decided to wait for the Kindle 2. I’m glad that I did. Size (in inches): 8″ x 5.3″ x 0.36″. Connectivity: EVDO modem with fallback to 1xRTT; utilizes Amazon Whispernet to provide U.S wireless coverage via Sprint’s 3G high-speed data network. Check our wireless coverage map for availability. This expanded coverage is only available for Kindle 2. See Wireless Terms and Conditions. 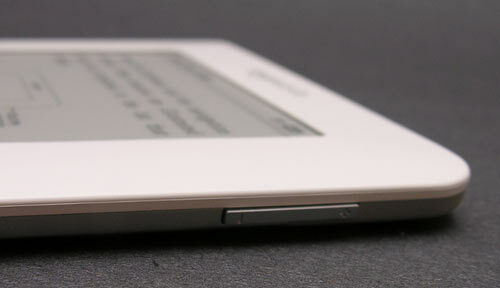 The Kindle 2 is approximately the same width as the original device, but is slightly longer. The display is the same size and resolution, but is capable of 16 shades of Gray instead of only 4 shades. I was immediately impressed with how thin the Kindle 2 is when compared to the original Kindle. I wasn’t a big fan of the wedge shape and probably the main reason why I decided not to buy the original Kindle was the fact that it has buttons along both side edges. 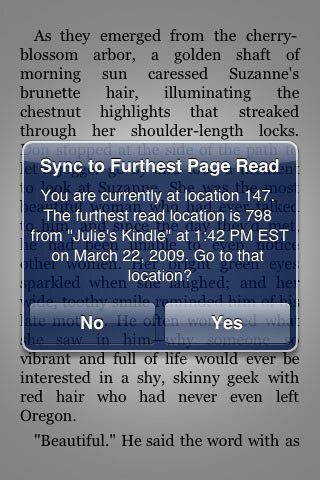 Every time I would pick up the reader, I would accidentally activate a button. In my opinion the Kindle 2 is much nicer looking that the original. I like the thin flat design and rounded corners. The top half is made of sturdy egg shell White plastic. While the back is a brushed aluminum. You’ll also notice the speakers located along the bottom edge. There isn’t a user replaceble battery in this newer model and there’s also no SD card slot. However, the memory has been increased from 180MB up to 1.4GB. The top edge has a 3.5mm stereo headphone jack and a spring loaded power switch. You’ll find a micro USB connector and charging status LED on the opposite edge. There are two thin slots on the Left side of the Kindle. These are attachment slots for protective covers. One thing to note is that the Kindle 2 does not ship with any type of cover or case. On the Right side you will find the volume controls. The QWERTY keyboard has hard round and slightly domed keys. Although the keys are small, they do have good tactile feedback. Thumb typing is not hard at all. Instead of the shiny navigation strip that the original Kindle had, the Kindle 2 has a spring loaded 5-way joystick style button. The button is made of hard plastic and also has very good tactile feedback. Above the joystick is the Menu button and below it is a Back button. On the Left side of the display are Next page and Prev page buttons and on the Right side of the display there are Home and Next page buttons. 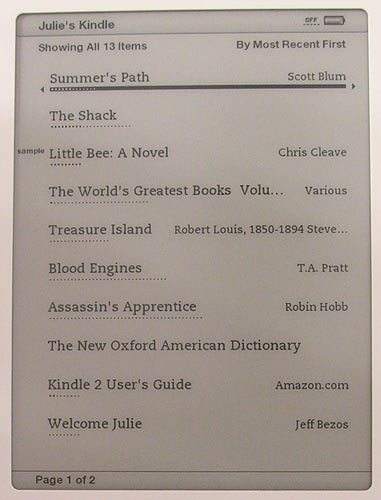 I had no problems at all navigating around pages and menus with the Kindle 2. It feels very intuitive. Charging the Kindle is accomplished with the included micro USB cable and AC adapter. The adapter is very compact and portable. 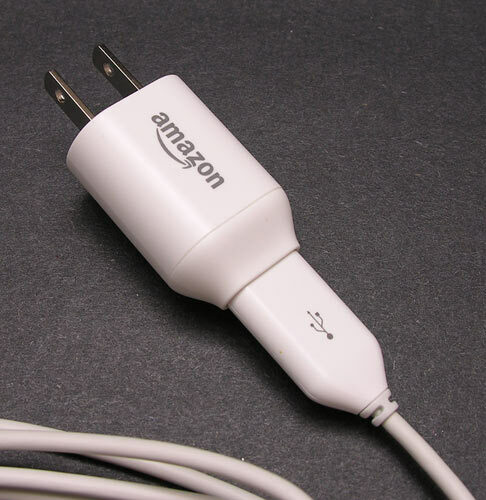 You can also charge the Kindle through a powered USB port. I have tried this on the original Kindle and haven’t had success. It either isn’t supported, or is extremely slow. 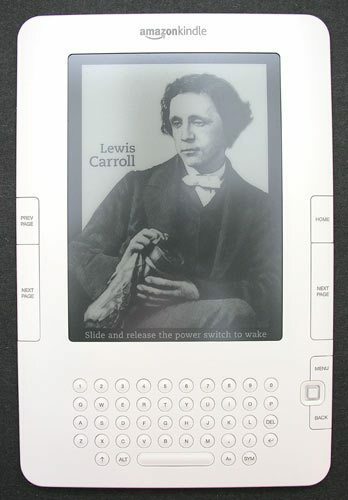 The display uses the same technology as the previous Kindle. It’s still mono and is not backlit. The lack of a backlight was a concern for me as I have problems with low light vision (darned corneal dystrophy). That said, as long as I’m sitting in an area with decent lighting, the Kindle is very comfortable to read. 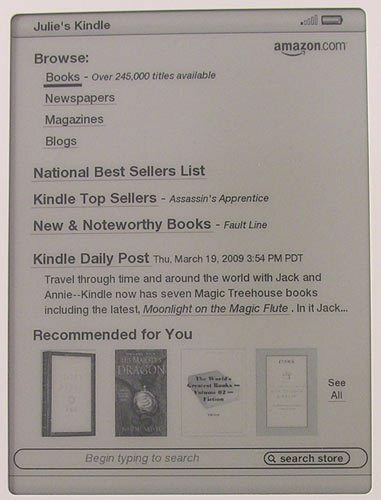 I still do hope that a future version of the Kindle might have a backlight. If you like to read outside, you won’t have any issues with screen glare. The screen is fantastic in full sun. The images I’ve captured for the review were taken without flash in a medium lit room. The user interface hasn’t changed that much with this new model. It’s still simple and non-cluttered. 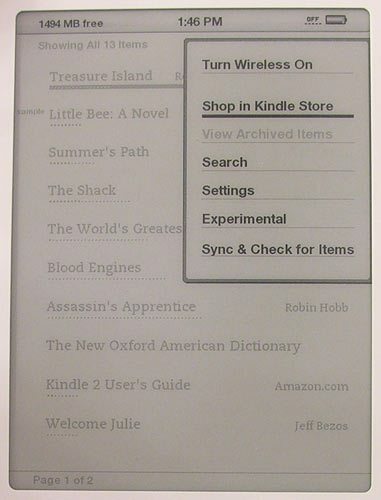 The Home screen lists all your books and at the top of the screen, you can see the status of the wireless connection and battery. You’ll notice that below each book’s title is a dotted line. This line represents how far along you are in the book. The dots get slightly bigger and bolder to show your progress. Using the joystick, you just scroll down to a book title that you want to open and select it by clicking the joystick. Again, the user interface is simple and not cluttered by info that is not necessary. The book title is in the upper Left corner and your location within the book is displayed along the bottom. In the image you see above, the text size is set to the smallest size. And this is the largest size text setting. You can choose from six different sizes. Turning the pages is done with the large Next Page button on other side of the display. It feels natural and comfortable to read with the Kindle. It’s actually feels more comfortable to me than using the iPhone or iPod touch. I usually hold the Kindle in my Right hand, with my thumb over the Right Next Page button. 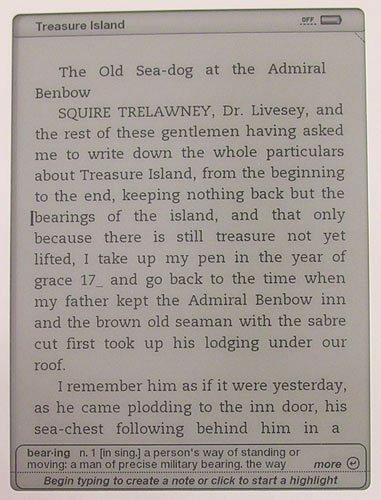 One of the most useful features of this ereader is the word look up feature. If you don’t know the meaning of a word, just use the joystick to move the cursor to the Left side of the word and the definition appears at the bottom of the screen. If you want to see even more info on a particular word, you can press the return button on the keyboard and it will load a whole page from the New Oxford American Dictionary, which is included on the Kindle 2. There’s a search function while in a book to search for a word and an expanded search feature from the Home page. 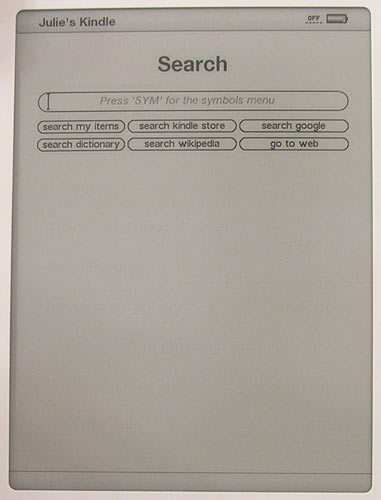 The Menu button will bring up a contextual menu depending if you are in a book or at the Home screen. 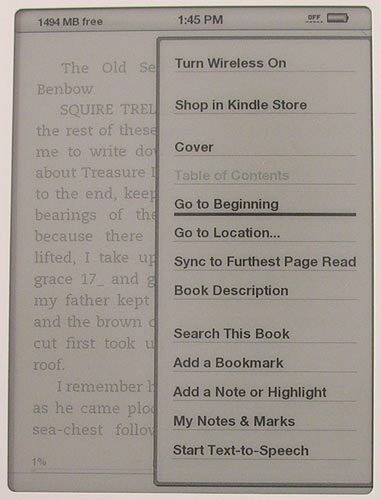 While in a book, you can navigate to different locations in the book, search, add a bookmark, notes or highlight text. You can also get a description of the book (this requires wireless). Two features new to the Kindle are Syncing and text-to-speech. 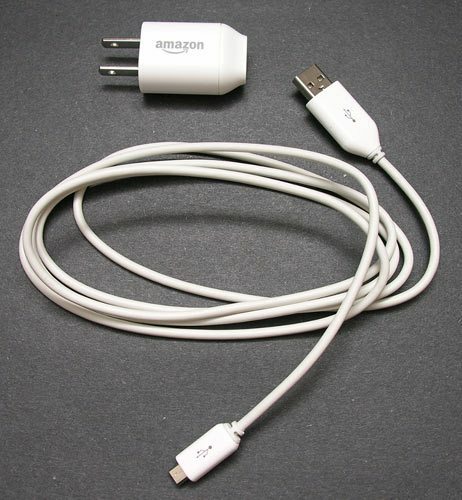 One of the main selling points for the Kindle is the ability to buy books directly from the device using their free Whispernet wireless connection. That means that you do not need a computer to convert and load books on to this reader as long as you are in the wireless coverage area. The Kindle has a built in EVDO modem that uses Sprint as the carrier. Where I live, I do not have Sprint coverage… BUT, I do get a signal on the Kindle because I it’s roaming on Verizon. My signal isn’t very strong or fast, but I am able to buy and download books. The online store is easy to navigate and wander around in. 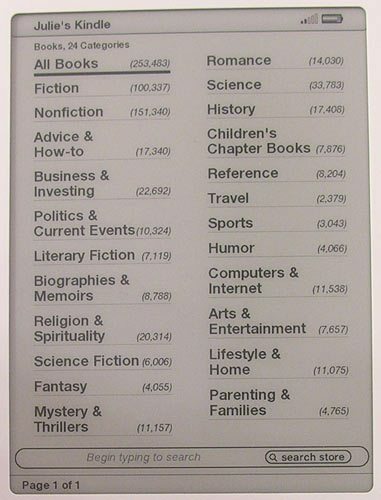 The numbers in parenthesis are the number of books available in each category. You don’t just find old books to buy, even the latest and greatest titles are for sale. New York Times best sellers typically sell for $9.99 each. 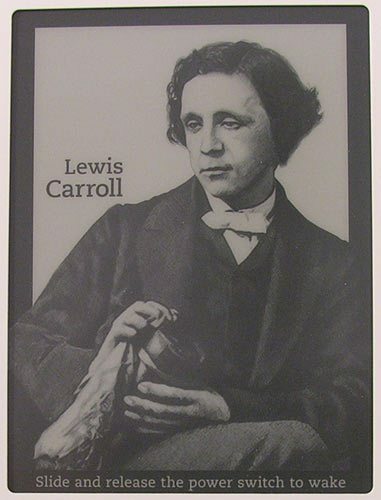 The book lists show the cover art, titles, and rates. 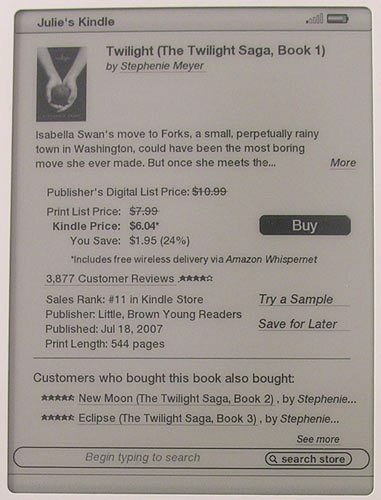 You can purchase books directly on the device or get a free sample first with an option to buy the whole book once you finish reading it. Prices are actually a lot better than I remember them being with the Sony Reader. You can even find free books to download through the online store. Amazon knows what it’s doing with the instant gratification aspect of their store. When you click Buy, you don’t have to go through the pain of signing on, giving your credit card number or anything. It uses your Amazon account and the payment method already setup there. It’s easy, it’s fast, it’s addictive 🙂 Even with my slow connection, I could buy a book and have it ready to read in a couple minutes. In addition to books, you can subscribe to newspapers and magazines that will be delivered right to your device. There aren’t many magazines to choose from yet, only 24 or so including Time, Newsweek, Reader’s Digest, etc. I’d be more excited about magazines if the Kindle had a color display. If you’re cheap and don’t want to buy books, you can help yourself to any freebies that Amazon makes available, or you can download books from other sites and convert them to the Kindle format (.AZW). There are free tools available that makes this very easy. Stanza and Calibre can both save to AZW format. I’ve had the Kindle 2 for a few weeks now and I have been enjoying using it. It feels slightly faster than the original kindle at turning pages and does have a better battery life. As long as I don’t forget to turn off the wireless radio, it might last for close to two weeks between charges. If I forget to turn off the radio, I’ll be lucky to get a day and a half out of a charge. I think the Amazon Kindle will eventually do for books what the Apple iPod has done for music. People were skeptical with the original Kindle, but I think as Amazon continues to improve on this wireless e-book reader, that it’s definitely going to happen. 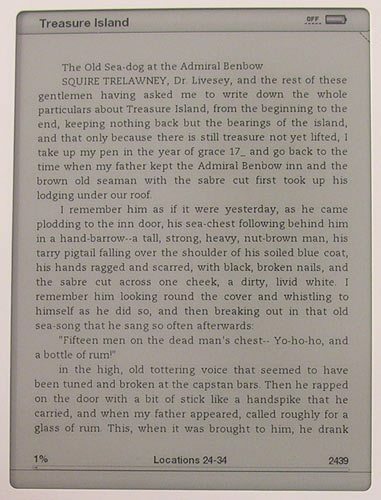 You cannot add a backlight to the Kindle (or any e-ink screen) because the text is opaque: you need an overhead light to show it. My wife just got the K2 along with an M-edge case that has a tubular light inside that works fine. I have had the K1 for over a year and see no need to switch: the K2 is essentially the same (the increase to 16 shades of gray means very little when viewing black and white text). The increase in speed of page turning is negligible. And frankly I just don’t see how the K2 is so much better looking, it still has all that white plastic around the screen. There are some nice improvements in the menu functions. The browser is primitive to the point of being pretty useless, and the included dictionary is too small. Note also that a whole bunch of new devices are coming on the market (from China, Russia, even Ukraine) and I worry that there are too many of them. Reading books is one thing, listening to 5-minute songs is another: the market is much smaller, and I don’t see this being nearly as revolutionary as the ipod. 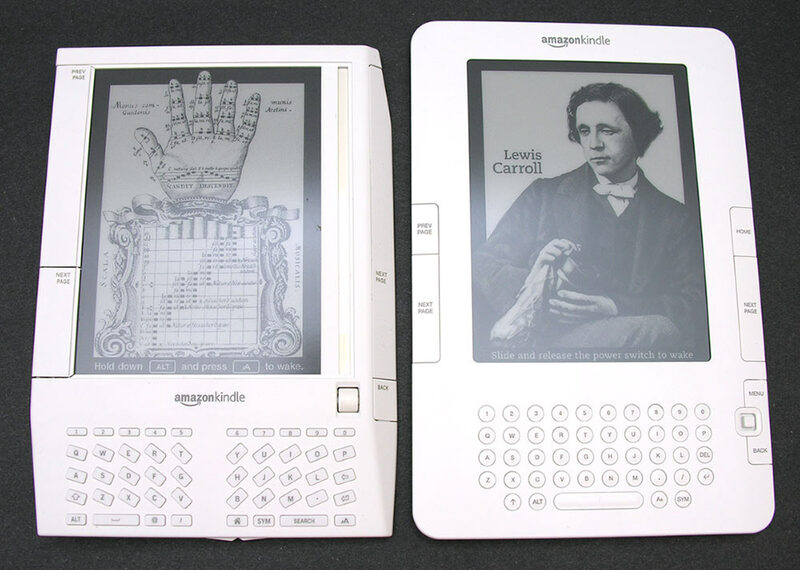 I like the new form of the Kindle 2 over the Kindle 1. It feels more solid and you don’t hit a button every time you pick it up like you do with the original. I also prefer the location of the power switch on the Kindle 2. The opacity of e-ink is a big part of why it’s more readable over long periods than LCD, so I don’t think we’ll ever see a useful version of it with *back*lighting. 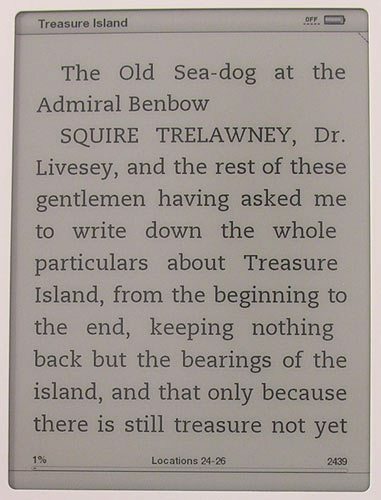 However, it probably would be amenable to frontlighting, which I believe is how the latest Sony reader does it. I don’t know why we haven’t seen more e-book readers with that, actually. couldn’t you use “frontlighting”. I don’t really know a lot about screen technology but couldn’t you stick a small light at all the sides of the screen. This is the best comparative coverage (with photos!) I’ve come across yet. Thanks for a really appreciated post. After seeing the Sony’s attempt at front-lighting (PRS-700), I was underwhelmed. The display unit had several ‘hot spots’ and the center of the screen suffered from a distinct lack of proper illumination. And as most of the words are in this spot, I would find it a major distraction. My wife bought a clip-on book light for her K2, and reads just fine after I’ve gone to sleep. I recently bought my wife one for her birthday, and she loves it for the most part. For her, the biggest problem is that it doesn’t have native PDF support. She’s an academic and is hoping to use it to read papers. While she can (and does) get the PDFs converted (either by Amazon or third-party software), the extra step is annoying. Her brother has the backlit, touch-screen Sony Reader, and the screen isn’t nearly as nice for general usage. The only time the Sony is better is when you have to use the backlight: the extra layers in front of the screen (for touchscreen and lighting) degrade the quality significantly. The Sony’s native PDF support is another significant advantage. Julie, one further question: why do you want to backlight the text? 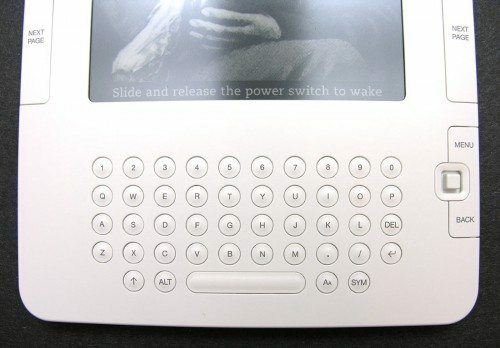 The whole point of eink is to mimic real print, and avoid the phenomenon of having a light shine back into your eyes, which is what tires me out when I read for long periods on a normal computer screen. Backlighting would change eink to the point where it is no longer eink. BTW, the Sony is not backlit, it is sidelit and as one commenter noted above, the sidelighting is not particularly satisfactory. @Philippe the only reason why I desire some type of backlight/frontlight/sidelight/etc. is that I could then read from the Kindle 2 in lower light situations. I have a Kindle 2 and have found it to be absolutely fantastic. I thought I would want back-lighting, but with even a little bit of light it’s pretty easy to read. Clip on one of those itty-bitty book lights and it’s great even in a dark room. I’ll take the E-Ink and no backlighting and battery life that seems to last forever over trying to read on a laptop any time. I do agree with one of the posters here that the browser really is quite simplistic and pretty much useless except for browsing things like the Amazon store. For it’s stated purpose though…reading…the Kindle 2 is just great. It’s so much nicer to be able to carry around a few books in a very light thin package. No more fumbling with paperbacks…no more bookmarks! As for a case…I bought a neoprene case and light on eBay for $12. The case is very good and the light is okay. It’s obviously meant to clip on a real book and not the Kindle…but it does work. Is the Kindle as revolutionary as the portable audio player? In some ways more…but it will never sell as well…because in the end it still requires people to want to read and in this ADD/ADHD world that’s not something people really want to do. Now, if they can get the price down to $100 I’d suggest every school start buying them and dumping textbooks. It will save on costs, and students backs. It would be a far better expenditure than the computers they buy and toss after a couple of years. I basically like my K2, as I currently carry 7 books inside 10.2 oz. That makes me happy. I never have to be without a book, when I finish one, I begin another. What I am really upset about is that they sold this device on the premise that the computer can read to me. Now, with the latest update, that feature is potentially disabled by the publisher. It is not disabled on my notebook. I can do that there. There is not any comparison between a computer generated voice reader and an audio book. That stinks, and it just isn’t fair that they took money promising one thing, and then caved in on that feature and allowed a third party to control it. When might you use the computer voice reader? I find that if I am reading something technical, listening to the voice reader as well as reading the written word, jams the seemingly boring data into my thick skull better. It is a good feature when your mind tends to wander. You can speed that voice reader up or slow it down to match your quick or slow comprehension, but in either case, you increase comprehension very much. I own both the Sony 505 and the Kindel 2 readers. Sony makes a case and a plastic light shield for the 505 reader. and because of that, I prefer it to reading the Kindel at night, or in any poorly lit situation. Maybe some other company can provide the same type of device that is available only from Sony. I also like the Sony because it a lot more compact. However The Keindel is still my choice, because of it’s versatility , and the quantity, and prices of their books. I am considering buying K2 for tech eBooks. I know K2 works well with novels and so, but I don’t know how tech books will look on it. I heard it was hard to read on Sony eBook. Recommendation? @Soo Yee I haven’t seen the latest Sony eBook reader, but the original one didn’t have that great of a screen in my opinion. The K1 and K2 are a lot better. After spending many hours reading reviews like this one, went ahead and got a K2 over a Sony 505. The wireless capability, text to speech, on demand dictionary and keyboard more than make up for the extra cost of the K2. I loved your review…!! After reading it, I had this impulsive urge to buy the K2 but I have more question before I take the plunge. Wireless capability seems to be the buzz word for the K2 but what if you don’t live in the US? What is a better option for people outside the US? Also, is there a Dictionary integrated into the Sony PRS-700? @Kal You don’t ‘need’ a wireless connection to use the K2. You can copy books to the K2 using a USB cable. As for a dictionary in the Sony PRS-700, I don’t believe it has one. @Kal – Unfortunately, not only does the wireless not work outside the US, but you can’t even buy a Kindle or the books for it without a US credit card and shipping address. Once the Kindle is in your hands, you don’t need the wireless to buy and download content — it’s all saved in your account so you can download it and put it on the Kindle through USB. What you will miss out on without wireless is the automatic backup of bookmarks and notes, and syncing between multiple devices. The problems I have with the Kindle is that I travel outside of the US and would want to be able to download new books while on long trips and of cousre the cdma link works in few countries (does work in Indonesia/Bali at a price). Also the lack of any backlight would make reading on a plane (when the lights go out) not so easy. That and the lack of plug in flash storage is another issue. 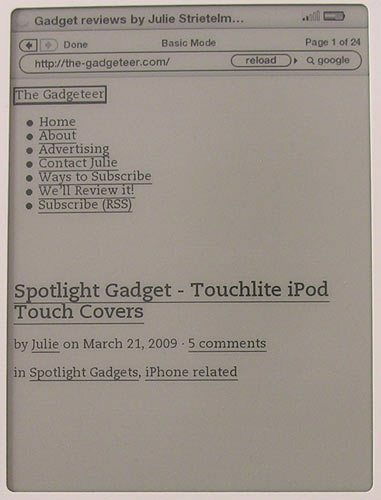 All-in-all my ideal ebook reader hasn’t been made yet, as far as I know. Thanks to all who have posted on this site. I have read so many reviews of the Kindle, Kindle 2, Kindle DX and Sony Reader that I had almost decided not to purchase any of them. However, your postings seem genuine and without bias. I have found it difficult to weigh opinions when there could be other motives involved. I have decided to buy the Kindle 2! Thanks again for your opinions. 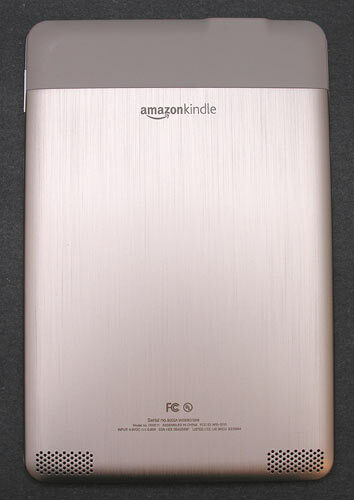 @Heather Please let us know what you think of the Kindle 2 once you get yours and have had a chance to use it. Thanks for the detailed review. I’ve been considering purchasing an e-reader but have one nagging question. In the past, I traveled regularly and this would have been a fantastic addition to my carry-on. These days my out-of-state travel is down to a few trips each year (mostly to see family). But I can definitely see myself using a Kindle on those trips. How often do you really use the Kindle at home/work? If you had a favorite book and a Kindle both within easy reach, which one would you pick up and read? For me, that’s the real test of how successful this technology will be. I just found – and installed – a free ebook reader for my iPod Touch as well as my iMac. I’ll put some free books on miPod and see how I like reading them there. There’s a good chance that I’ll have some extra cash to buy a K2 in a week or so. 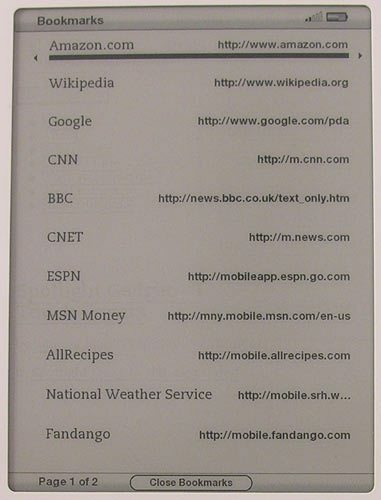 I noticed that ebooks are available in many different formats (file types). 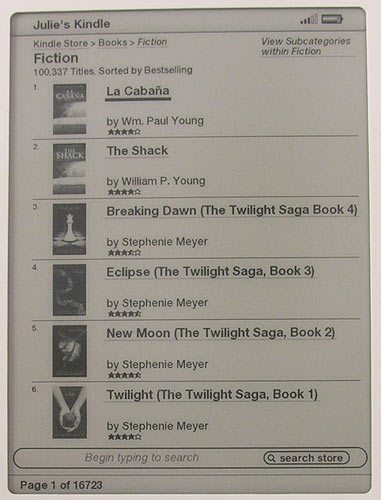 Will the Kindle read them all or do they have to be in Kindle’s native tongue? That’s the app I DL’ed for both the mac and the pod. Now I have a use for that Airport card! I have only been shopping for an e-book reader for a short time, but the experience has been somewhat confusing regarding “standards,” formats and user “necessities.” As others have expressed, this site seems to be very unbiased, and I am very happy to have come across all the very helpful reviews and comments that so many folks are contributing to this site. It looks like I will now be able to take the plunge into the e-book pool by deciding on the Kindle 2 and probably the M-edge case with the reading light (…and yes, I’ll also be back to post my own opinions:o). Meanwhile, thanks to everyone for your help in making these difficult decisions. PS: The Kindle 2 is also now on sale at the Amazon Web site! Thanks for a great review Julie. The pictures were helpful too. I think I made my decision to buy a Kindle 2. I look at ereaders frequently, and so far not one of them grabs me. The reason is that none of them support all the formats out there. I don’t want to be stuck with a device where the book I want to read can’t be read, because the format isn’t supported. Nor do I want Amazon in charge of my library. So while it looks nice and I’d love an ereader, I won’t buy one yet. The main reason is the price — I can buy a LOT of books for $350 — the second reason… format. The iPod had the advantage that every song out there is available in mp3 format. I wonder how it would have fared if music were in 10 different formats and it only supported one of them. The format needs to be one industry standard, readable on *any* device, not just one (that includes PCs and Macs). Before that comes to pass, I don’t see a point of buying one. This was an excellent review – thank you. I am not American!! So I cannot buy a Kindle or, it appears, a Sony Reader. 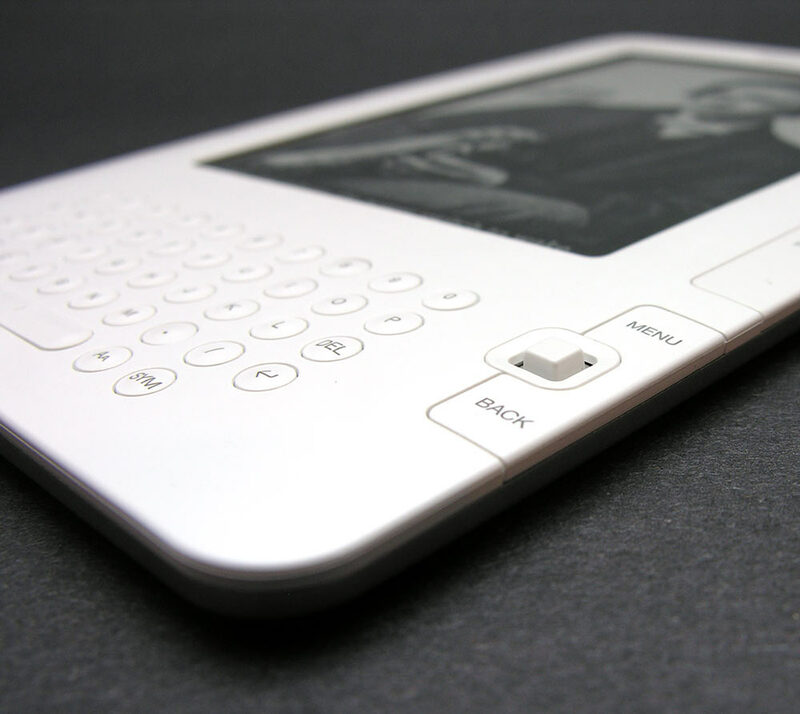 Is there an eReader on the market for non-US citizens? @Fiona if you could get someone to send you a Kindle, you could still use it in Australia – just not the wireless feature. You can convert various book format files using a free program called Stanza and then copy the books to the Kindle using USB. My e-reader is my Touch. It’s color, backlit, and fits in a pocket. No way would I EVER consider a Kindle. I’ve got 3 or 4 e-reader apps on my Touch. My wife and I both read books on our Touchs, which is far more convenient that holding a much heavier book. Try reading on a Kindle in the dark, or in dim light. LOL! This is a great review. My roommate is an avid book reader and is very curious about converting to an eReader to save on book costs (after recovering the initial eReader cost). We have often looked at the different readers available, but we never really felt like we were getting enough information to make an informed decision, until now. Thank you so much for posting this detailed review, I believe we will be saving to invest in a Kindle 2. Julie, you produced a WONDERFUL review! I have some thoughts about the Kindle 2. First of all, it’s a nifty product idea but has serious limitations. Let’s talk about Page Numbers. It uses these crazy numbers to locate where you’ve been the last time you read the materials: like, location 14-16 – as if you’re going to remember that, especially if you’re reading more than one thing. I’m an academic. Most of our material is in PDF format. We simply have to know the page number of the article we’re reading in order to cite it in our papers. Instead, we have the locations. Good News! I’ve figured out a way to get page numbers on PDF files: 1) You take a blank Word document and format it the way you want it to appear (1.5 spaces; 12 points after paragraphs; 2) you bring up the file you’re working with in Adobe and copy the whole article to the clipboard; 3) you paste the clipboard into you’re formatted Word doc. Voila! Page numbers. Granted they’re not on every page, but they are on the page where the words start or end, and anyone can figure out that what precedes or follows the number belongs to that number. Other gripes: they enter the material you receive in the order you receive it. So, if you have multiple docs by one author – Lord knows which one is which. You can’t highlight the entry and have your entire file name show up. The entries should be alphabetical – that way you know what the name of a book starts with and can readily find it. When you receive your document it tells you that it’s from “Amazon Kindle Support.” In the subject line it has “Your Amazon Kindle Documents are here.” No kidding. The subject line should be the title you give the document before you send them off. That way it would be easier to locate a given article by multiple authors. Finally, I wouldn’t give up my Kindle now that I have page numbers on my PDF files! It’s great. I don’t have to lug around a backpack full of articles. And, I can listen as I read which gives double input – not to mention what I haven’t read and listen to it in the car. Terrific reviews! I’m not deciding yet. Am torn between the Sony and the Kindle. Or hm, maybe a tablet PC! Fortunately I can afford to wait and hope that the formats standardize and the prices come down. Will be watching for your reviews of future readers. When readers become available globally & one can download books in all countries in all languages…then I will be there, cash in hand. I am considering buying the first Kindell and was also looking for a case that has a light in it or that connects to it easily any suggestions? I have found all of these comments really useful, and Julie’s review very informative. My wife reads a lot, almost all fiction, mainly thrillers. She reads anywhere but mostly in bed or curled up on the sofa. I’m thinking of buying her a K2 for Christmas. Amazon ship to the UK now and the cost inc delivery is $259, about £155 UK. Some of the comments suggest you can’t use the wireless facility outside the US. Is that still the case? Would people say it might fit for somebody like my wife? Are there enough titles avaialble in her preferred genre? Her only bad habit is turning the spine of the book back on itself, thus damaging the spine. I suppose this would stop that! Any thoughts would be greatly appreciated. As for book selection — it’s been my experience of the Kindle store that they have plenty to choose from in any popular genre. There are probably some differences between the US and UK availability of some books, but Amazon says that there are 300,000 books available to UK users so I’m sure thrillers are well covered. You should be able to see which titles have Kindle editions available when looking at them on the web, so you can check for stuff that your wife might like in advance. I wasn’t aware that I would have a problem down loading books from my house. Seems there’s no wireless in my area. I might not have bought the Kindle had I known this in advance. I ordered the Amazon Kindle with guaranteed Christmas Eve delivery. It didn’t come on Christmas Eve, nor Christmas Day. I called customer service and shortly afterward I received an SMS text message stating that they’d attempted delivery on Christmas Eve (even though I was home all day and their “attempted delivery” time was one minute from the time it was scanned at a facility 15 miles away). You would think they would offer a few free ebooks or something — given the fact that they had obviously disappointed a customer with a failed guarantee. Instead, the only thing they offered was for me to return the product. Thanks Amazon customer service — that really helps me out, seeing as how I was unable to give a gift on Christmas day due to your failure! why carnt i buy a kindle2 in the uk. yours p,jackson. Can anyone comment on the differences between the K2 and the K-DX, especially as to whether the increased screen size has benefits that outweigh the increase in carrying size and weight in a handbag (that’s a purse to Americans). I am having 2nd thoughts on buying Kindle2. I like the sleek design. the eggshell cover and its amazing battery life. the only thing holding me back in buying Kindle 2 is that if i buy it now then after a month or so a new product is released which had better functions and design then kindle 2 then would it be worth buying it??? i know this question is quite funny but I am anticipating for a better product.